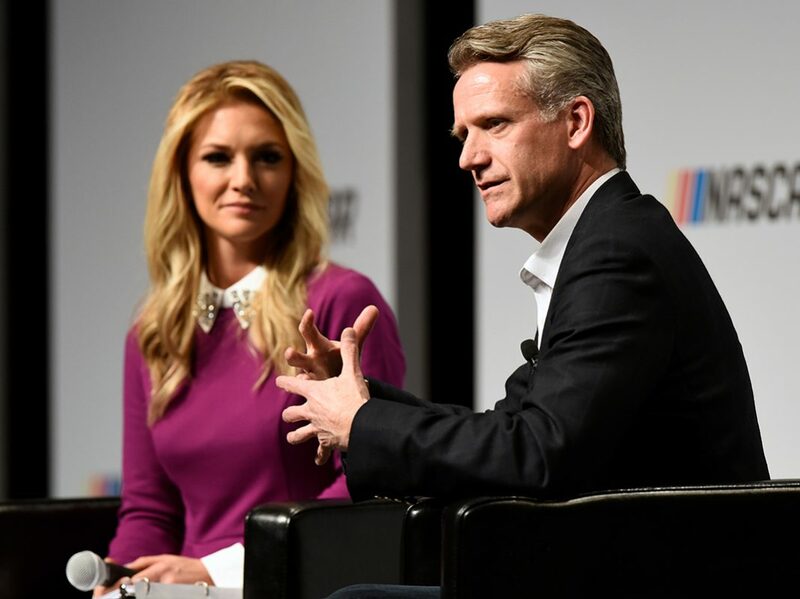 Steve Phelps was named president of NASCAR in September. Prior to November’s Championship Weekend at Homestead-Miami Speedway, Phelps sat down with members of the media for a question-and-answer session. Here are excerpts of that interview. Q: What changes is NASCAR looking to make to the schedules? Phelps: In short, I think everything is in play. So, we’ve heard from our fan base that they would like to see more short-track racing. They want to see more road courses. They want to see less cookie-cutter tracks, whatever that means. I think that we are working with our broadcast partners and with our tracks and with our teams and drivers to get input on what each of them believes would be an ideal schedule, and then we’re obviously doing fan research as part of it. So, do I believe that everything is on the table? I do. Will we see a lot of the things that have been talked about, so more short tracks, more road courses, doubleheaders, midweek racing, pulling the season forward? All those things would be in play. I don’t know what’s going to happen, but we are working diligently on what a 2020 schedule would look like. Q: The five-year sanctioning agreement ends after 2020; will that prevent a 2020 shakeup? Phelps: The five-year sanctions go through the 2020 season. So, if we are going to make significant changes to our schedule, we need to make sure that our tracks are on board with what those significant changes would be. Do I think that our tracks are interested in looking at that? I know they are. And they’re doing that because that’s what our fans want. Is every single decision or everything a fan will want, are we going to do that? Probably not. But for us, yes, we will need to have significant conversations both with our race tracks and the broader industry, but the race tracks in particular if we are going to have significant race schedule changes for 2020. Q: Would NASCAR co-promote events with IndyCar? Phelps: Again, I’ll go back, the 2020 schedule is something that we’re looking at right now. Whether it would include IndyCar and NASCAR, I know there are people that would like to see that. I think it would be a good show. We have to figure out how that works and kind of the broader plans of what our schedule looks like for 2020 and beyond. Do we have conversations with Mark (Miles) and Jay (Frye)? We do. There are many people that do. And I think that we share a common broadcast partner in NBC. NBC would, I’m sure would enjoy something like that, as well. So, it’s a possibility. Q: What is the status of the new premier series title sponsorship model? Phelps: Right now, we have no news to tell or announce at this particular point about who is going to be there. I can say that we’ve had a significant number of meetings with potential sponsors. There is a general excitement around what the model could be and where it’s going. So, I’m bullish on making sure that we have the right sponsors in there and I’m bullish that it’s going to do what it is intended to do, which is to make sure that we are getting sponsors at that highest level and rewarding them for what they do for our sport. Q: Is there a culture of cheating in NASCAR that needs to be addressed? Phelps: I think, listen, we’re going to look at the inspection process. Will there be changes to it? There might be. That will be up to Steve (O’Donnell) and his team to figure out the best way to do that and figure out what is going to be in the best interest of the sport. You know, and we’ll look at that. Obviously, we’ll have discussions with our race teams and make sure that folks are comfortable in the direction that we’re going in, but at the end of the day, we will make that decision. Q: Is NASCAR interested in hybrid or electric race cars? Phelps: I think it’s a good question. I think, is electrification … in the future potentially? Yeah, it certainly is. Can I see a time in the future that we will have that? I definitely do. When we get there, how we get there, what it looks like, there’s a lot of work to do between now and then. But I can assure you that we are looking at it right now. Q: Drivers seem unhappy to be here; can NASCAR do something to fix that? Phelps: You know, we have a long season and I think that if you look at our drivers, to generalize it as they’re not having fun, I think is a little bit unfair. Are there drivers that have bad days and not as excited as they might be? You probably have that now and again. With that said, we’ve got some tremendous, young and up-and-coming drivers who are excited about going to the race track and trying to win and compete every day. … I know I’m having fun. I hope you guys are having fun out there, too. But I think to say that our drivers are not having fun I think is a generalization. Q: Has the charter system met NASCAR’s expectations? Phelps: I think the charter system has allowed us to have dialogue with our race team that is formal. Do I think that’s a positive thing? I do. Do I think we were going in that direction anyway? I do. Do I think it can improve? I absolutely think it can improve. And that really has to do with us working with the race teams, more than, hey, it’s faulty. We are going to work with our race teams to figure out how we put on the best racing. We are going to work with our race teams to try to figure out how to make owning a race team as efficient as it can be, and that’s both driving revenue and looking to create efficiencies in owning a race team. Q: What is NASCAR doing to attract new team ownership groups? Phelps: I think it comes back to making sure that owning a race team is something that’s just not a hobby. You know, it is a business. You need to have people who love it, so Roger Penske loves racing, and we need to make sure that we find that next Roger Penske, we find that next Jack Roush, we find that next Rick Hendrick. If they’re not going to have folks in their family that will carry on that tradition, we need to go outside. I do believe that making sure that teams are healthy will help us in all three series. So, we have made some changes from a structural standpoint, a cost standpoint in the Truck Series that has made that series more viable. You take a look at the NT1 engine and it makes it more viable to own a race team. Do we see that as a positive step in the health of that series? We do. We’ll see some of the same things in Xfinity and then I believe ultimately, we’ll see the same thing in the Monster Energy NASCAR Cup Series.